-insert #9 “C” clip to #2 casting to retain motor shaft with minimal end play (if unable to seat “C” clip totally in the trench, . loosen the screws ( a couple of turns) that secure the back plate holding the large bearing from behind the casting, insert . the “C” clip, retighten the screws that were loosened for the insertion of the “C” clip. -insert #16 spacer on motor shaft, with metal pin sticking up and having previous spacer’s pin inserted in hole of this one. -insert #17 final truncated cone with key into motor shaft key slot, having previous spacer’s pin inserted in hole of this one. Completely tightened, ensure there is minimal axial end play (< 1/32”) on the shaft in relation to the casting. If there is Excessive play, diagnose and fix the problem, before proceeding. -verify that entire motor shaft assembly with spacers and rotors spins freely, without touching stators, if touching, will need to . dis-assemble to the point that shaft with remaining rotors spin free, and not touching stators. -Loosely attach final #19 end cover with 90º elbow, rotate the cover, so that intake nozzle points to the input hose, when positioned . with the mounting holes matching the casting screw hole threads, now press the end cover tightly to the shroud and secure attaching . the 3 clasps on the side of the shroud to the ridge on the edge of the end cover, tighten until snug (do not over-tighten). - verify that entire assembly to this point spins freely, connected under power in 729, right side up and down in its final position, with The nozzle pointing down. Make sure there are no noises from vanes rubbing on each other, and NO overheating of motor. When Connected to the vacuum power receptacle, press “LOAD” button to start the pump, press “UNLOAD” button to stop the pump. -test by loading a tape, ensure tape is drawn into vacuum columns and does not spill out, then tape should slow rewind to Load Point. -test the Load, Unload, and high speed and normal Rewind operations. The centrifugal force of the spinning rotor vanes causes the air to be pulled through the input nozzle by the the vacuum created, causing the accelerated air flow to spin against the outer wall of the pump circular housing. The air flow is then captured by the fixed stator baffle and redirected to their large center hole, to be pulled again by the following stage rotor vanes’ vacuum. The process is repeated by the five pair of rotor/stator stages. The bands position the stators, and the spacers position the impellers, preventing these from touching one another during their rotation. The resulting air flow is rushed out through the four ports around the motor casing, performing some cooling of said motor as it spins with its maximum load. When to vacuum air flow is restricted, by the tape in columns, the flow is minimal and so is the load on the motor, reducing the need for air flow cooling. As the assembly is installed with the motor on top, and its shaft with the rotors and spacers facing down, the weight of these causes the large motor bearing to remain in place to the casting by the large “C” clip and the raised portion of the shaft going into the electric motor coils. In this writing we are merely documenting the staggering task (in my feeble mind) of how these mountain of parts came together, in a team effort by many of the individuals of the CHM restoration team, which through brain storming, mind melding, empirical processes (read: ‘trial and error’) , and luck, have been able to put this puppy together, without the help of any reference material, instructions, or even a parts catalog picture. It all was started when someone noted that there was little vacuum force to pull the tape down into the columns of the 729. Then it was decided to take apart this round “black box(? )” to see if there was something obviously wrong, since it appears to be the one and only surviving pump of this shape and size in existence, to fit in this particular 729-V.
Once the pump was taken apart, it was determined that the main large bearing needed replacement, and some very crafty individual procured a new one, of the exact OD, ID, and thickness. The pump was re-assembled and found to still not work properly, very little vacuum was observed. After a few more trials, the pump seized up and overheated. At this point it was disassembled into its 40+ components. To the most casual observer (yours truly), putting back together this mountain of parts in their exact position was a daunting task…. I went home thinking about these bunch of parts : rotors, bands, spacers, etc. Late in the evening (confirming the known rumor that stepping away from a problem, taking a break, and returning to it at a later time) I began in my mind to think (what to smarter people is obvious) how this pump must be put together…. What first looked as 10 rotors, 5 of one kind, 5 of another, now looked as 5 rotating vanes, 5 stationary baffles, and separating spindles for the rotating parts, and bands for the stationary baffles. Next time at work, we found that someone else thankfully had put this vacuum pump together already ! The pump was re-installed it on the 729, and still would not work correctly, eventually making noises, overheating, and seizing up again. Taking the pump apart again, it was noticed that the rotors and stators had actually ground into each other, where initially it appeared that these were rotating totally free and noiselessly. It was further noticed that the “C” clip, holding the motor shaft to the casing, had come out again from the trench where it should be normally seated firmly in…….. upon further inspection it was noted that the bearing in the shaft would not totally clear the trench in the casing, to allow the “C” clip to be totally and securely seated. Taking the shaft apart from the motor, it was noted that the large bearing was not totally inserted flush to the end of the shaft’s position where it should be resting upon. There appeared to be no way to move said bearing further into the shaft, and began thinking that perhaps this needed to be a press fitted with aid of heating/cooling the parts to allow for proper positioning. With great patience, one of our team members found a “sweet spot” in the rotation of the inner raise of the bearing and the shaft, where the bearing would slide with ease…. The bearing was then properly seated all the way to the point where the motor shaft increases in diameter. At this point we observed that there was end play of the shaft into the motor, towards the end where the external laminated tag is located. We then felt we needed to have some spacer(s) needed to limit this end play. Further thinking about this, it appears that since the vacuum pump is assembled with the motor pointing up, and the shaft with the weight of the rotors and spacers pointing down, the shaft is really secure by the “C” clip and the force of gravity, thanks to Mr. Newton. We now know that we need to test manually and under power this pump, holding it in the same direction as it will be when installed within the 729 tape drive, so the loading on the shaft does not allow the axial play. Someone further remarked that even though the pump shaft was rotating clockwise, instead of CCW as noted in markings in the shroud, the pump still has vacuum when running backwards (! ), but not hardly as much as when running correctly. Someone with lots of experience pointed this fact out, which is hard to believe….. perhaps one possible explanation may be that the rotors spinning in one direction contrary to the routing of the stators’ baffle vanes exert less of a force in the air movement, due to their shape, resulting in the air flow initially being routed in one direction, but then forced to the correct direction by the baffles’ vanes. It should be noted that the rotors and stators are numbered as they came out from the pump during disassembly, and their direction marked in relation to the marking on the pump’s external shroud, so number10 is the one closest to the very inside, immediately after the motor, while number one is the one closest to the external end cover with the input nozzle, as the pump rests upside down from its intended position inside the 729. With the able assistance of Ron Crane, who figured out how to be able to properly insert the “C” clip and totally seat in its trench, by loosening the retaining plate where the large bearing is going to slide to, installing said clip, and re-tightening the retaining plate. The parts were then re-assembled as before, ensuring no end play. The motor was checked facing up and down, before installing end cover. With the cover on and under power inside the 729-V, the pump was tested again facing up and down, with intake nozzle unobstructed and closed, for a long period of time, and all worked OK. The pump was then formally installed in its final location and with the connecting vacuum hose. The pump was run for a long period of time (5 minutes or so) to ensure no grinding noises and no over heating would take place. All tested OK. The 729-V was then operationally tested with a tape mounted, performing LOAD, UNLOAD, and High-speed/normal REWIND OK.
After fixing a small unrelated problem to the vac. 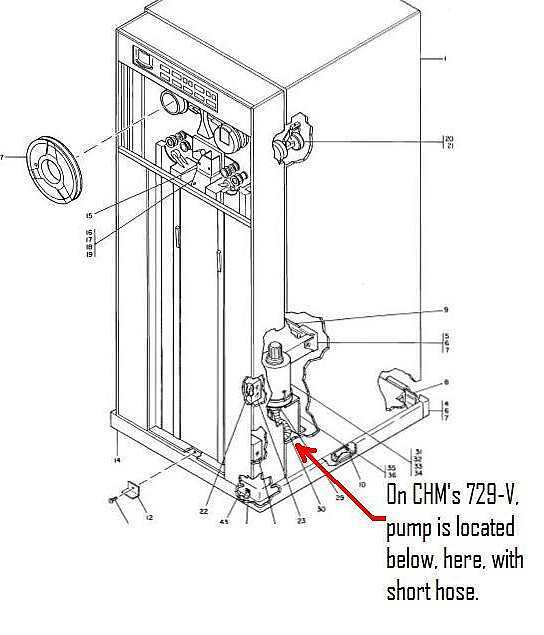 pump, the 729-V was connected and tested from the 1401 OK.
Comments/corrections to this ‘live’ document are welcomed. After the vac. pump was assembled, tested, and verified working correctly (as far as we could tell), a couple of weeks later, after diagnosing and fixing some more problems with this tape drive, we got to the point of attempting to load a tape. We encountered the problem that the tape would load on the left column, all the way down to the bottom, without stopping at the vac. sense diaphragm switches, and would spill on the right side, without even going into the right vacuum column. After making sure that the magnetic powder clutches were working OK, we stated thinking that perhaps our favorite vac. pump was not providing enough suction to pull the tape down on both columns. With piece of IBM card, we created 2 vacuum blocking strips, one with a small hole made with a ball point pen. Pressed the load button, the vacuum pump started up, but the process hung waiting for the head to come down, which it did not, on purpose, by our disconnecting the Head Motor. We placed the strips at the bottom of the vac. columns, and with vacuum being sucked in only through the little pen hole, we measured one column, then the other, BOTH measured 8.6” of water. We tested the drive next to this one, not having any load problems, and got the exact same amount of 8.6” of water, ruling out the vac. for the spill problem. Re-connected the head motor, tried to reload, and noticed that the idler on the left capstan was spinning CCW, as the tape was being loaded, but pulled into the left vac. column only and not the right. Noticed that there existed a large gap between the right idler and the right STOP capstan. I repeated the process on the next tape unit, not having load problems, and there was NO gap between the Idler and the stop capstan, allowing the right column time to pull down the tape into the right column. Re-connected the capstan motors, performed LOAD operation, and now, after adjustment of the stop capstan, it works perfectly. So by not being adjusted correctly, the tape was being pulled only to the left column, since the larger radius of the tape on the supply reel fed more tape initially and pulled the tape from both reels into the left column only.